I shared all that I could think of in yesterday’s Caffeinated Randomness post. We actually hit 2 out of 5 days. We (me included) were overcoming nasty colds. I had a very persistent headache! We got math and language arts and a little reading done. I call that successful. Oh! I was mentioned in one of Lee Binz’s posts on her The HomeScholar blog!! Never Harsh or Scary. Check it out! Other than Sonic’s Happy Hour or a trip to Target, probably no where. We will be seeing Brian’s parents this week. This means that I have to get out the detailed cleaning list. Pray for me, ya’ll! Seeing the light bulb come on when I was doing All About Spelling with our 9 year old. Sitting, thinking and coming up with a game plan for our family’s future in our new church and our retail business. We’ve had All About Spelling for over a year now and I dabbled with it here and there. All the while knowing the awesome benefits of it. I finally worked it with our 9 y/o and it’s working for her! I am so delighted to find Sue’s (The Homeschool Chick) journal and be inspired to move forward in our homeschool journey. I’m actually weary of wallowing in the same old same old. I know well what my short-comings are. It’s time to see the good. This was a fun photo to take. It was one of those rare moments that we didn’t have all of the kids with us. It was about 11:30 p.m. 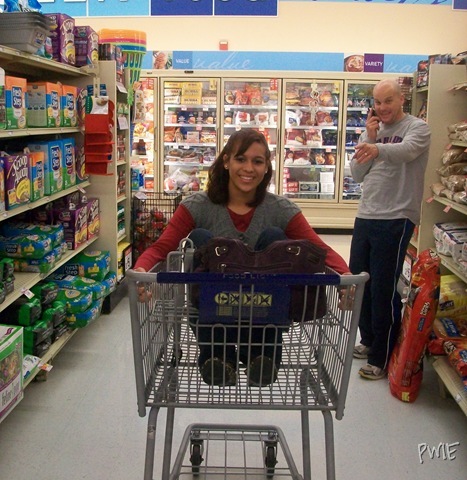 Her feet were hurting her so I offered to push her in a buggy. Clicking on The Homeschool Mother’s Journal button will take you to THE link up page.